A game against Everton is always going to be a tough one, because under David Moyes the Toffees are well-drilled and hard-working, making it a battle to win supremacy in midfield. With a midfield of the likes of Tim Cahill, Marouane Fellaini, Phil Neville, Steven Pienaar and Leon Osman, your own midfield men have to put in an extra shift to keep them in check. The home game earlier in the season has proved our only setback at the Lane under Harry Redknapp and that was courtesy of a deflected Pienaar shot. There was not a great deal in the game that night and hopefully, it will be another tight contest, with the Spurs defence considerably better now than at that early part of the campaign. However, to stop the Everton midfield will mean a lot of energy required from Jenas and Palacios in the middle and with Modric and Lennon tracking back to cover the wide midfielders and the over-lapping runs from full back by Leighton Baines and whoever plays on the other side (Tony Hibbert or maybe Neville dropping back into defence). Tim Howard in goal is a good shot stopper. but sometimes his positioning leaves openings for players to beat him, especially at his near post. With the shot son, Tottenham's players will need to take them, rather than try to walk the ball into the net. 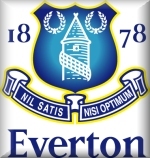 It is up front that Everton have suffered this season, with a large number of their forwards being injured, but on loan from Manchester City, Jo has looked a different proposition in a dark blue shirt, while Louis Saha is back although Cahill might play alongside the big Brazilian or even Osman. The youngster Jack Rodwell has been making a name for himself and he may be used from the bench, with a role just behind the front two to break into the box and finish as he did against Aston Villa in the FA Cup. Another one to watch in the future is Dan Gosling, bought in from Plymouth Argyle and a player who likes to get forward from midfield too. Joleon Lescott and Joseph Yobo have been paired to good effect in the middle of the back four, while there is added height to the team and not just in his hair cut by Fellaini. He is dangerous from set-pieces and in the tackle by the number of cards he has received this season. Cahill can also lose his discipline on occasion. However, with the FA Cup just a few weeks away, the Everton players will have it in the back of their mind, although I imagine that Moyes will not let them shirk in the game. Spurs kicked off and played towards the Park Stand end in the first half. With Everton the masters of pulling off narrow wins and Spurs nor recently renowned for winning on their travels, a point at Goodison Park was a good result, but in a scoreless match among a season of turmoil and goals in most games, it was a surprising outcome. With events back in Honduras leaving Tottenham without Wilson Palacios, the "race for seventh place" is a lot less important than what had happened to his kidnapped and murdered brother. Our thoughts go out to him and his family. It appears that the sombre mood quickly spread throughout the ground, as the rain fell, the teams failed to play to their potential and the crowd settled back to enjoy the poor fare on display quietly. Spurs had the better of the opening third of the match and Everton came back into it, but the scoring attempts were few and far between, with neither goalkeeper being over-worked and only the singing of the Spurs crowd disturbed the quiet. Well, that and Mr. Mason's ever-blowing whistle. If ever there was a referee who needed to watch either the Champions League semi-final first leg game at Old Trafford or the first leg of the Blue Square Premier play off semi-final between Torquay United and Histon, then Mr. Mason is your man. Both games showed what can happen when referees accept that there will be contact in what is a physical game and that not all contact is a foul. Even Rob Styles played some good advantages last week without needing to blow up every time a player touched another one. Perhaps it was surprising that he failed to do anything when Rodwell almost kicked out at Hutton, when the Scot was on the floor. With absences due to injury and other reasons, Redknapp set the team up in a 3-5-2 formation, deploying Hutton and Bale as wing backs and Corluka, King and Woodgate as the three centre-halves. It seemed to upset the 4-4-2 that you expect from Everton. The home side were content to throw crosses into the box all day, aiming for Jo or Cahill, with Lescott up from the back for set-pieces. What they failed to do was to put Gomes under sufficient pressure with the direction of their balls into the area, as he was having a day when his decisiveness in coming for crosses was less than certain. The first decent cross that was played into the Toffees box was one which caused some concern. Bale's ball in from the left fell kindly for Robbie Keane, but Jospeh Yobo threw himself in the way to block the Irishman's eighth minute effort. A couple of minutes later, the ball came in from the other side, when Hutton's low cross was stepped over by Keane and it took Joleon Lescott to get there first to kick it out for a corner ahead of Defoe. With Gomes choosing to punch on most occasions, one of them went out to Modric, who passed to Defoe and although he was stopped in his progress, Bale picked up the loose ball and couldn't get the ball beyond Howard. Tottenham's wing backs were pushing Everton back and the passing from the midfield were giving the home side plenty to think about, but the usual failing of not making the possession pay had reasserted itself in the Tottenham players' minds. Too often good passages of play ended with crosses which did not make their intended target, which, with two short men up front was vital or the ball was picked off too cheaply. One good move just after the quarter hour was put together and Hutton was brought down from behind by Lescott, which earned the Everton defender a yellow card. Gareth Bale lined up the free-kick, but by the time he reached the ball, Steven Pienaar was less than five yards away, such was his desire to close down the shot. He too got a yellow card. With the wall back 10 yards, Bale took the second opportunity to hit the ball with some pace and it fizzed inches over the angle with Howard not even close to it. Halfway through the half, Spurs put together a flowing move, with Gomes finding Modric, who linked with Jenas and Keane, before JJ put Keano in for a shot that was well blocked by Lescott. This produce done of a string of corners, but again, nothing positive came from them, as they were easily cleared by the taller Everton defenders ... or where they were played in to the near post, some of the smaller home players. Everton started to come into the game a bit more after the half hour, with Pienaar volleying at goal, but Woodgate blocking it and then the South African almost put Jo through on goal, but Ledley King got back to slide in and stop his shot. Shortly afterwards, Baines headed into Fellaini's path, but the Belgian shanked his shot well wide. Then right before half-time, Jack Rodwell burst forward to hit a 25 yard shot that flew powerfully at goal, but Gomes was comfortable in letting it go over the top. The second half was a much more sedate affair. Everton have a FA Cup Final on their minds, while Spurs were perhaps down about their team-mate's bad news and Mason wanted to interrupt play at every possible opportunity. It didn't flow and Spurs moved to a more traditional 4-4-2, which saw it almost cancel out the Everton system. Cahill's header early in the second half was blocked by King and just before the hour, the Australian midfielder hit a shot across goal with Gomes diving to his right, but the effort went just wide. The Spurs keeper almost gifted Everton a goal when he caught a corner, but then dropped it before getting it at the second attempt. He had already given Spurs fans heart attacks with some nervous footwork in his own box, when Jo closed him down and he only just got past the striker. The closest to a goal came in the 68th minute, when Gomes flapped and Gosling fired a shot down into the ground, which bounced up and hit the outside of the post on the way off. it could have gone anywhere, but fortunately, it went into the ground, which took a lot of the pace off it and it wasn't likely to hit too many players, which a low shot might have done. Strangely, the best Tottenham chance came just a minute later, with Corluka playing the ball infield to Jermaine Jenas and he put a short pass in to Jermain Defoe, with his back to the goal, on the edge of the D. In one move, he spun around to hit a left foot shot inches wide of the goal, with Howard rooted to his line. In the remaining 20 minutes, Everton had a coupe of long shots that went wide, while Spurs tried to see out time, leaving the game scoreless and the home crowd roundly booing the referee at the end. There haven't been many 0-0 results for Tottenham this season, but with the defence improving at home and Tim Howard keeping a record 16th Everton clean sheet in a season, perhaps it was the most likely outcome here. The new system seemed to provide the home team with problems and I guess Harry's comments about trying players out and learning a lot about them means that it was a worthwhile exercise. But for those travelling that far, it seemed like a day trip to forget. Unfortunately, for all the wrong reasons, that will not be the case for Wilson Palacios.